These are fair dice, regulated by the Nevada Gaming Commission, meaning no one is cheating anyone by making dice that favor landing on any side over the others. You can even test this yourself before you play the game. There are two modes of play, called Game 1 and Game 2. In Game 1, you play twenty rounds of the following: player rolls her single die once, dealer rolls his single die once, and the higher number wins the round. The winner of the game is the person who wins more rounds. If both win ten, extra rounds are played until a winner is determined. The bet is applied to the entire game, not individual rounds and cannot be changed until the end of the game. 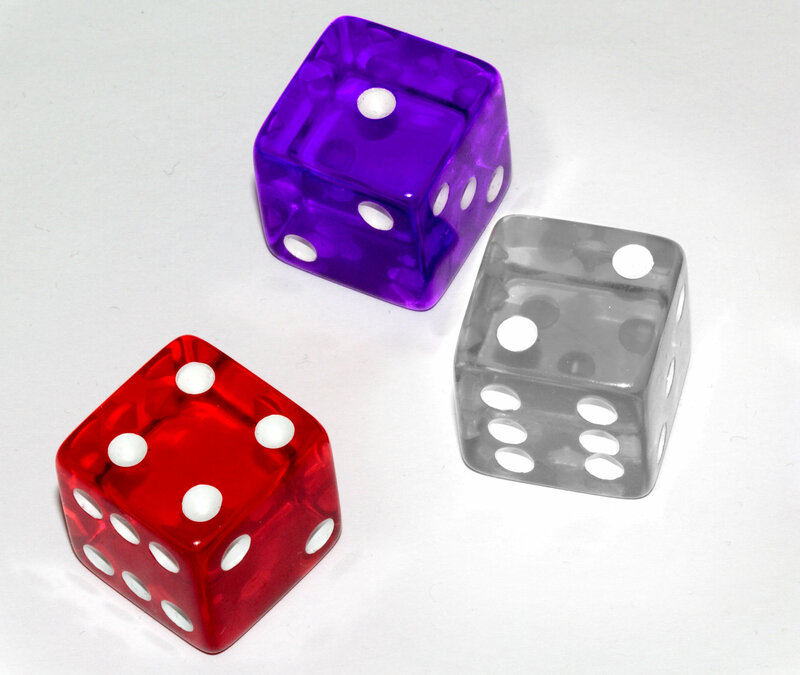 In Game 2, you play twenty rounds of the following: player is given two dice of the same color to roll, rolls them both simultaneously, and sums them. The dealer does the same with his two same-colored dice. The higher sum wins the round. Ties (a round with the same sum for player and dealer) are re-rolled and do not count as one of the twenty rounds. The winner of the game is the person who wins more rounds. If both win ten, extra rounds are played until a winner is determined. The bet is applied to the entire game, not individual rounds and cannot be changed until the end of the game. Before die selection (see below), the player bets a certain minimum by moving their stack of chips to a certain place on the table, Square A or Square B. When the twenty rounds are over, if the dealer wins either Game 1 or Game 2, he keeps your stack of chips. If you win Game 2, you get your stack back plus a new stack the same size. Double or nothing. If you win Game 1, you get your stack back plus a new stack the same size plus a smaller stack one third the size, rounded down. 2.3333x or nothing. When you walk up to the table, you do not get to choose Game 1 or Game 2 directly. Instead you choose from Scenario A or Scenario B by placing your chips in Square A or Square B, respectively. After bets are paid off, dice are returned to the dealer, and the player can again choose Scenario A or Scenario B and play another twenty rounds. In scenario A, the player chooses her die color first and chooses Game 1 or Game 2. Then the dealer selects a die color and they play twenty rounds of the game chosen by the player. In scenario B, the dealer chooses a die color first, then the player chooses her die color, then the dealer chooses Game 1 or Game 2, and they play twenty rounds of the dealer's chosen game. For the answer and some analysis, see my earlier article about the dice.